Jesus (alternatively called The Jesus Film) is a 1979 Biblical drama film that depicts the life of Jesus Christ. It primarily uses the Gospel of Luke as the basis for the story. It was co-directed by Peter Sykes, John Krish, and an uncredited John Heyman, who was also the film's producer. It was filmed on location in Israel. In 1976, producer John Heyman approached Bill Bright to fund a project to put the entire Bible on film. The project would eventually be scaled back to just one book of the Bible, Luke. The film would be financed primarily by Campus Crusade for Christ supporters Bunker and Caroline Hunt for a sum of $6 million. Filming took place throughout the Middle East and Israel over the course of several months. Jesus was produced by John Heyman. Former Jesus Film Project director Paul Eshleman, who was on location during much of the principal photography, revealed in the DVD's audio commentary that Brian Deacon, who portrayed Jesus, was so committed to the film and its message that he read several Bible translations a day in order to make certain that he properly presented Christ's teachings. Because Deacon developed pneumonia during principal photography, doubles were used in certain scenes. Instead of creating a parallel story for the film or embellishing the biblical account, as is the case with other biblical films such as The Ten Commandments or The Greatest Story Ever Told, the filmmakers chose to adhere as closely as possible to the Gospel of Luke. At the end of the film it states that the Good News Bible (Today's English Version) was used for the filming. Most of the film's dialogue comes from Luke, which was chosen after Heyman sought advice from clergy and scholars. Many responded that the screenplay should be based on just one gospel, and that Luke should be used because of its completeness. Heyman was not pleased with the high-pitched accents of the Israeli cast members and decided to have all of the voices dubbed over. The only person who was not dubbed over was Brian Deacon's. 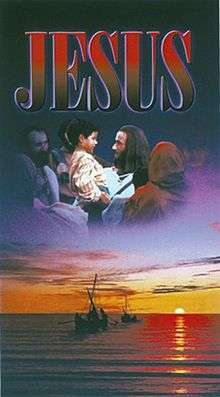 Jesus was released by Warner Bros. in the United States. It was not a financial success, losing approximately $2 million. The film received universal and critical acclaim by Christians and moviegoers alike for its outstanding portrayal of the accounts featured in the film, and it currently holds an 87% on Rotten Tomatoes. But while praising its "meticulous attention to authenticity", critics panned Jesus for being "painfully monotonous" and "little more than an illustrated gospel, with nothing in the way of historical and social context." The Los Angeles Times called it a "...dull Sunday-School treatment of the life of Christ, meticulously but unimaginatively culled from Luke 3-24." In 1981, Bill Bright created the Jesus Film Project organization with the goal of accurately translating Jesus into other languages and showing them around the world. The first translation was done for the Tagalog-speaking people of the Philippines. The organization works with thousands of missionaries around the world to show the film, sometimes to audiences who have never seen a motion picture. The Mandarin Chinese version of the film is widely distributed in China by the government-linked China Christian Council's Amity Foundation in Nanjing, both on VCDs and DVD. Distribution in the United States has included direct mail campaigns sponsored by churches to deliver a copy of the film to every address in select ZIP codes across the country. In 2004, the organization made the film available for viewing on its website in over 300 languages. Both Jesus and The Story of Jesus for Children are available in DVD and VHS formats. Audio dramatizations in a number of languages are also available. It is the only film that has been dubbed into more than 1000 languages of the world. As of now, more than 1400 languages spoken all over the world have the Jesus film, including in all major languages of the world. To make the film more relevant for younger viewers, new footage for The Story of Jesus for Children was filmed in 1999. It was then interwoven into an edited version of the original film Jesus and released in 2000. In 2001, a new opening sequence depicting the creation of humans, the expulsion from Eden, Abraham's aborted sacrifice of his son, and the prophesies of Isaiah was filmed to show, as Paul Eshleman states in the audio commentary, how Jesus' life fits into the span of history. In 2002, a special edition of Jesus commemorating the September 11 attacks was distributed in the VHS format. It contains introductions by New York City firefighters and police officers and has a running time of 83 minutes. An edited DVD version of Jesus was also packaged with JESUS: Fact or Fiction?, which was produced in 2003 by Inspirational Films. This features a section called the "Journey of Spiritual Discovery". Biblical scholars, historians, philosophers, authors, and ministers answer specific questions relating to God, Jesus, Christianity, the archaeological, scientific and historical accuracy of the Bible, and testimony from many Christians. Viewers can browse the numerous topics individually or they can watch the film and, when prompted by a "discovery glass" icon, can access relevant comments. After they are finished, the viewer is returned to the scene they were watching. To celebrate the 35th anniversary of the film's release, a new DVD and Blu-ray version was released in August 2015, complete with a new musical score and sound effects. Once again all of the voices in the film were dubbed over by unknown British voice actors. Brian Deacon returns to do the voice-over for Jesus. According to The New York Times, JESUS is likely the most-watched motion picture of all time. Project leaders claim that it has been viewed over 5 billion times by over 3 billion people. This claim has been greeted with skepticism by an evangelical leader. Vinay Samuel, former executive director of the International Fellowship of Evangelical Mission Theologians, has said: "These numbers are, to say the least, not gathered in a social-scientific way" and that "They have no way of knowing this". ↑ Shaila Dewan (2005-08-16). "Putting Jesus in Every Mailbox". New York Times. 1 2 Tom Buckley (1980-03-28). "Film:"Jesus" at Embassy; according to Luke". New York Times. ↑ Kevin Thomas (1979-11-02). "A Sunday-School Treatment of 'Jesus'". L.A. Times. p. H30. ↑ Franklin Foer (2004-02-08). "Baptism by celluloid". New York Times. ↑ The New York Times, July 22, 2003, page 1AR "1979 Bible Film is the Most-Watched Movie of All Time"
↑ Giles Wilson (2003-07-21). "The most watched film in history". BBC News. 1 2 Franklin Foer (February 8, 2004). "'The Passion's' Precedent: The Most-Watched Film Ever?". New York Times. Retrieved July 21, 2011.